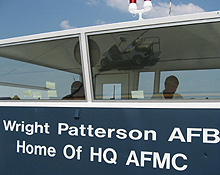 Wright-Patterson Air Force Base is located less than one mile from the city of Fairborn, Ohio. The City of Dayton is within 5 miles of the installation. The base is one of the largest and most important bases in the U.S. Air Force. The past, present and future at Wright-Patterson Air Force Base are all linked with the Wright Brothers' legacy. The Wright Brothers called Dayton, Ohio, home and Daytonians have long since called their city the "Birthplace of Aviation."